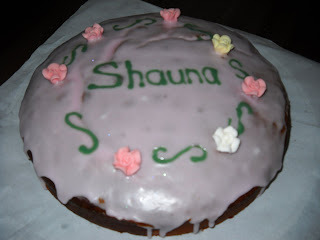 Just before Easter, I made the above cake for my colleague and friend Shauna's birthday. 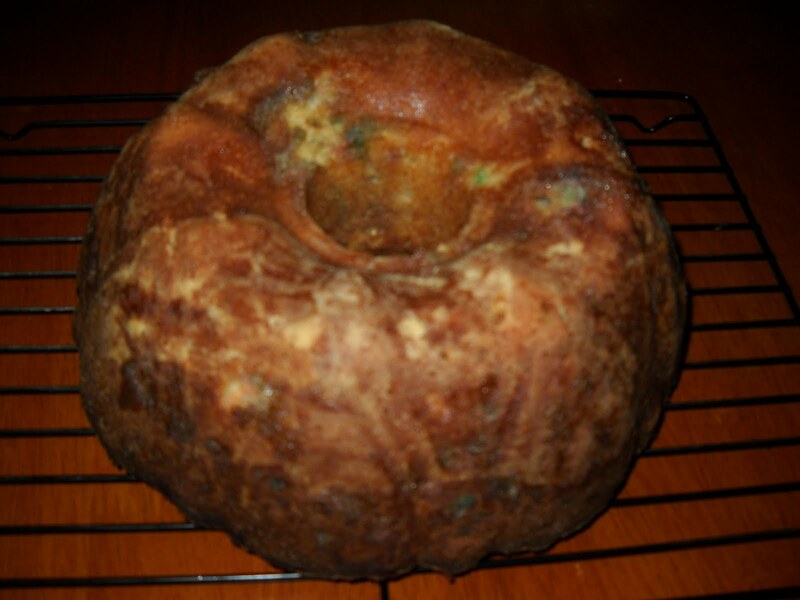 It is a an old fashioned marble cake, from the Australian Women's Weekly Bake cookbook. 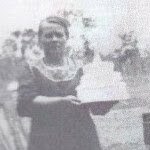 I made this cake using brown sugar instead of white caster sugar because at the time, that was all that I had in the house. It seemed to turn out just fine, regardless. 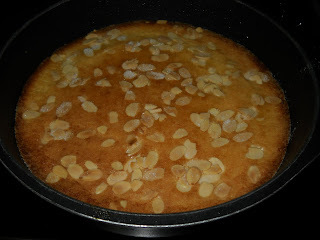 Although it is not the prettiest cake I have ever made, I think it is quite respectable, and tasted, well - like cake. I simply decorated it with water icing. 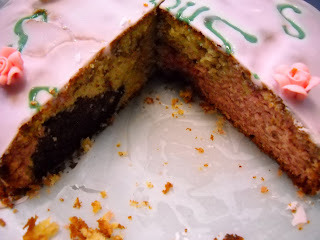 The recipe is very similar to this one, except that for the three colours, I had white, pink (using pink food colouring) and chocolate using cocoa powder instead of white, chocolate and orange. Marble cake is an old favourite and easy to make, although it is impressive to look at. 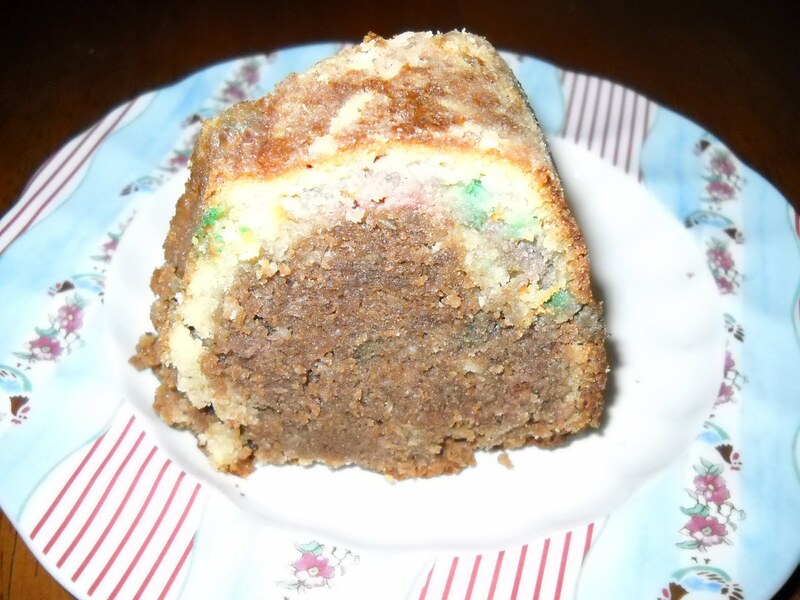 If you need a quick party cake, you could do worse than a marble cake. This week's Tuesday with Dorie is hosted by Mary of Popsicles and Sandy Feet, who chose Dorie's delicious Chockablock Cookies. They are called "chockablock" because they are full of all sorts of ingredients - chocolate, dried fruit, nuts and coconut. They are also beefed up with oats and molasses (or in my case, golden syrup). The recipe called for shortening and butter. I don't use shortening usually, so I just used all butter, and it seemed to work fine. 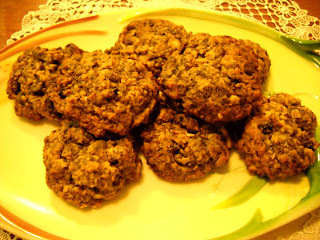 These cookies were fabulous - they require a lot of ingredients, which may make them prohibitive for every day baking, but are worth the effort if you have bits of this and that to use up. I did just that - I used mixed chopped nuts and almonds, cranberries, raisins and dried apricots. Thanks to our host, Mary, for choosing these - she will have the recipe on her site. To check out what the other TWD bakers thought of these, check out the TWD blogroll. Unfortunately, I could not get a hold of suet, so I used lard instead. I found it rather unpleasant to work with, as the smell and texture were rather off-putting. I decided for a change to make a savoury dish, and chose the recipe for steak and kidney pudding provided with the challenge. Because of the warmth in my kitchen, I found it difficult to pick up the rolled pastry, so I ended up half moulding it free-form into my pudding basin. I think this made the pastry a little thick to cook to perfection, as I ended up with a few under-cooked patches inside my pudding, despite steaming it for 3 hours. When I turned out the pudding, it collapsed a little on one side, so it was not as aesthetically pleasing as it might have been. 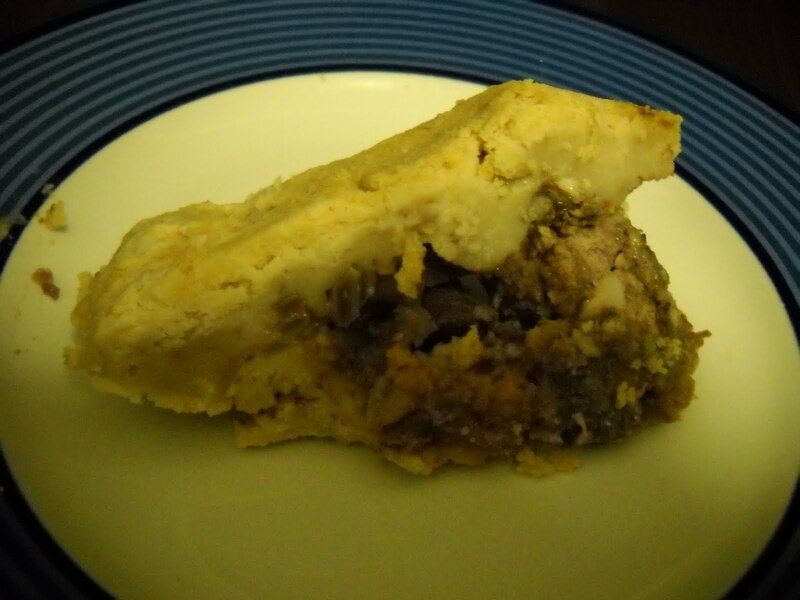 Despite the obvious defects, I found the steak and kidney pudding to be rather tasty. Unfortunately, perhaps because of its unloveable appearance, it was not popular at work, and I ended up turfing quite a bit of it. 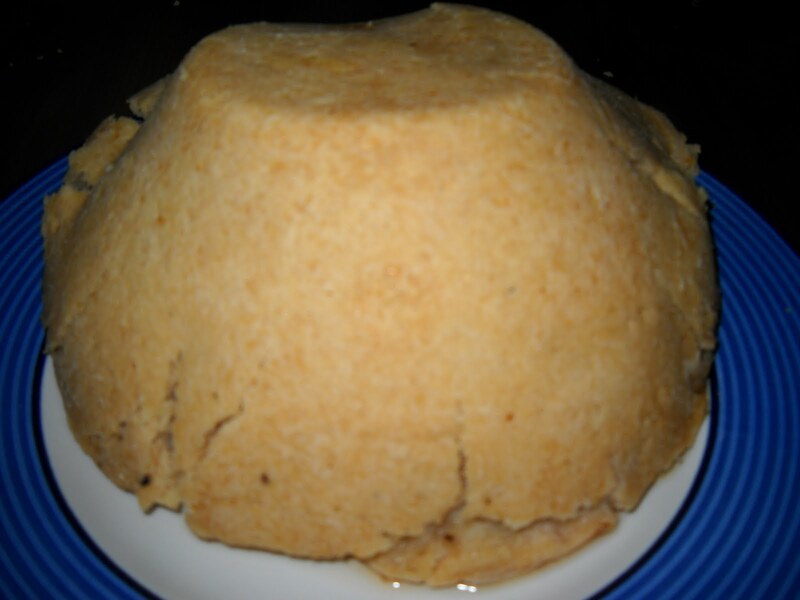 I have successfully made a lovely steak and kidney pudding using a similar recipe once before. 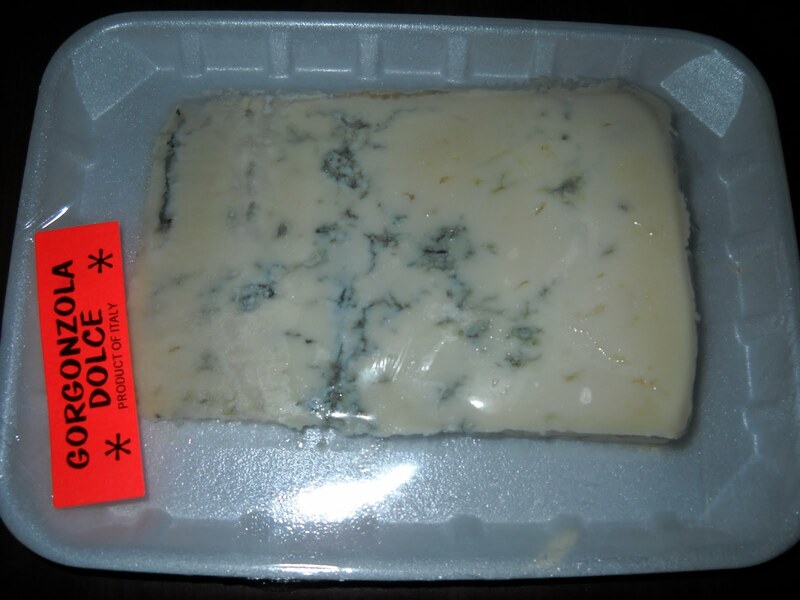 On that occasion, I use tallow (Supafry) in the pastry, and I wonder whether that fact, and that I steamed it for 5 hours instead of 3, the main differences this time. However, as I am unlikely to be making suet puddings on a regular basis, it won't be an issue that I will be investigating. Thanks to Esther for being our host this month. 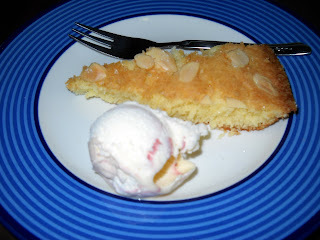 To see what the other Daring Bakers made with their suet pastry, check out the Daring Kitchen blogroll. This week's Tuesday with Dorie is hosted by Melissa of Love At First Bite, who chose Dorie's Sweet Cream Biscuits. When I first read this, I was thinking of Arnotts Assorted Creams (which one's your favourite? Mine is Monte Carlo). 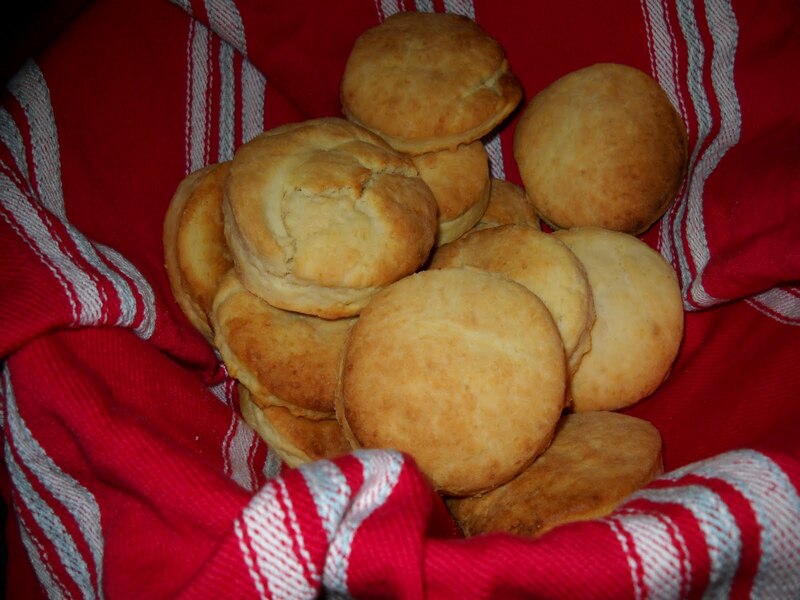 However, these are actually Southern US style biscuits, which are very closely related to our scones, and apparently are very popular eaten with savoury dishes. 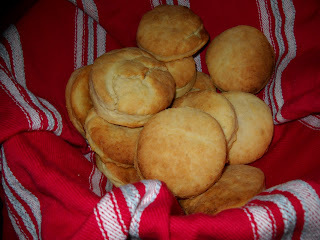 These biscuits were very easy to make - no mixer, no eggs, no butter. They simply consist of dry ingredients bound together with cream, pressed into a dough and cut into rounds before baking until golden. I had one warm with butter melting into it - delish! I have been very grateful for the simple recipes that we have had the past couple of weeks, as things have been very, very crazy for me in the background for the past few weeks. Things are going to get worse before they get better, so bear with me if I tend to disappear for a while. To check out what the other TWD bakers thought of these biscuits, check out the TWD blogroll. If you fancy making them yourself, check out the recipe in Dorie's book, or at Melissa's site. Today's post will be short and sweet. For this week's Tuesday with Dorie, our host, Nancy of The Dogs Eat the Crumbs, chose Dorie's Swedish Visiting Cake. What's not to like - it is a sweet vanilla plain cake with almonds on top and a crispy bottom obtained by baking in a skillet. It is delish served warm with icecream. See the blogroll for other interpretations of this cake, or Nancy's site for the recipe. A couple of weekends ago, I walked to Graceville to see A Single Man (starring Colin Firth) at the Regal Cinema. It is a beautifully shot film, with an ironic ending. It is set in the 1960s, and has wonderfully stylised period sets. Julianne Moore was wonderful as the ditzy friend with an empty life. On the way home, I dropped into the fruit shop at Graceville near the cinema, and was pleasantly surprised. As well as a range of fruit and vegetables which is far superior to the supermarket offerings, the shop stocked deli items which I previously believed could only be found in New Farm or the Valley. 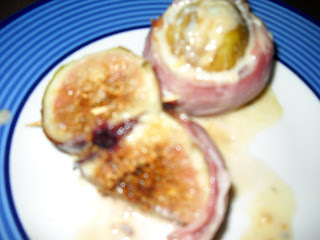 It was too tempting to pass up, so I bought some figs and gorgonzola, and picked up proscuitto and cream at the supermarket to make fichi biondi - that is, baked "blonde" figs with gorgonzola sauce. I had spied this recipe in the May 2008 edition of Delicious magazine when I was searching for Italian dinner party recipes, and had wanted to make it ever since. 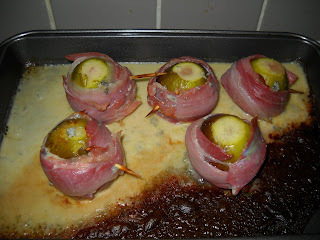 I wasn't disappointed - the baked figs were luscious, a little bit sweet and a little bit salty, and they melted in the mouth. Put the butter, cream and gorgonzola into a small saucepan, and melt over low heat, stirring until smooth. 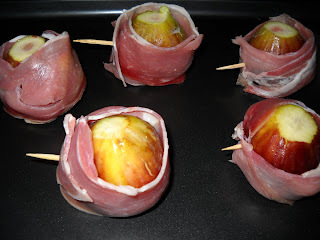 Put the figs into a baking dish, pour over the sauce and cover loosely with foil. Bake the figs for 7 minutes, then remove the foil and bake them for a further minute until the prosciutto begins to crisp. To serve, put 2 figs on a plate and spoon over some of the sauce. Delicious!! 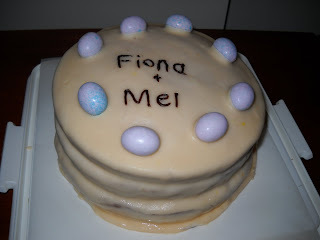 We had a spate of birthdays over Easter at work, so I was busy cake baking. Fiona and Mel were first up, and I made them an orange and blueberry layer cake. 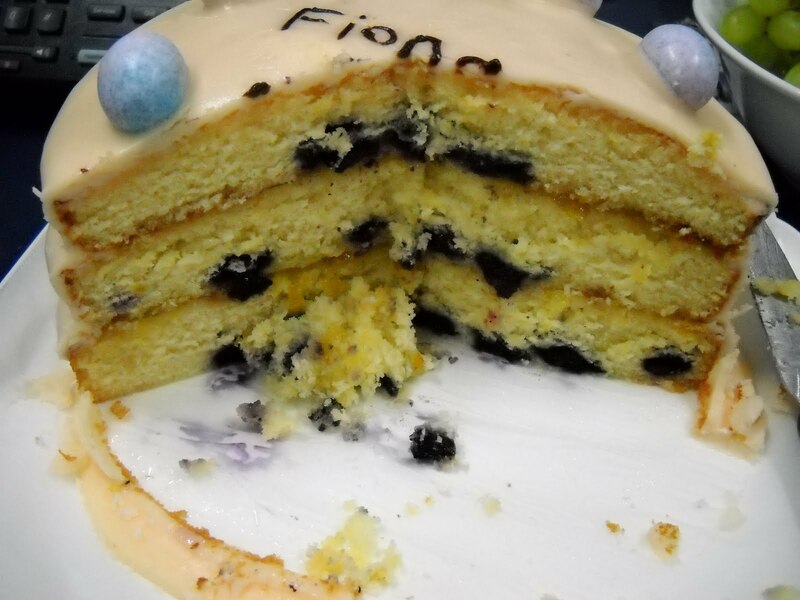 The recipe is modified from the Marbled Lemon Blueberry Layer Cake in Sky High - Irresistable Triple-Layer Cakes by Alisa Huntsman and Peter Wynne. You can find the original recipe here. I have made the lemon version - you can see it here. icing the cake with orange glace icing instead of buttercream. The top of the cake is decorated with gorgeous birds eggs (pastel candy coated chocolate eggs) and fudge writing. The cake disappeared, so I assume it was a hit! When I went to the bakery, I used to wonder how they got the little indentations in the top of the focaccia. I had visions of there being some fancy process, perhaps involving yeast, to get the indented effect. Little did I know until I made my own focaccia that you just poke the indentations in the top with your thumb! For my recent (or not so recent now!) dinner party, I made a garlic and rosemary focaccia from a recipe by Bill Granger in the May 2007 edition of Delicious magazine. This is how I learned about the shaping of the focaccia. 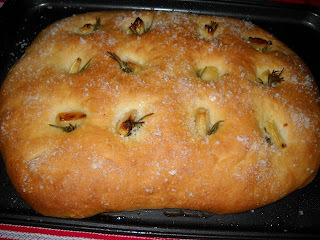 I found the focaccia a very quick and easy bread to make, and there are endless variations that you can make using the same basic recipe, simply by using different toppings. I also thought that the finished product looked professional, as if I had just ducked out to the shops to buy it. Sift the flour into a large bowl. Take 2 tablespoons of the flour and place in a small bowl with the honey and 300ml lukewarm water. Whisk to combine, then sprinkle the yeast over the top and whisk again. Let the mixture sit for 10 minutes or until the yeast activates. Add the olive oil and 2 teaspoons of salt to the flour. make a well in the centre of the mixture, and pour the yeast mixture into the well. Mix the ingredients together to form a soft dough, then knead the dough on a floured benchtop for ~ 10 minutes. Place the dough in a clean, lightly oiled bowl, cover with plastic wrap, and place in a cool, dry place to rise for ~ 1 hour or until it has doubled in size. Lightly oil a 24cm x 36cm baking tray with a rim. Knock the risen dough down into the bowl with your fist, then rest for 5 minutes. Place the dough onto the oiled tray, and push it out as far as possible with the palm of your hand to make a rough rectangle. Cover with a damp cloth, and set aside to rise for a further 30 minutes. While the dough is rising, place the garlic cloves and milk into a small saucepan over medium heat. When the milk is hot, reduce the heat to low and allow the garlic to cook in the milk for 10 minutes. Remove the garlic from the heat, and drain off the milk. Preheat the oven to 220 degrees Celsius. Poke 12 holes in the dough with your thumb, and push rosemary and garlic into each hole. Brush the top of the dough with oil, and sprinkle it with salt. Bake the focaccia in the preheated oven for 10 minutes, then reduce the heat to 190 degrees Celsius and bake for a further 12-15 minutes until the focaccia is golden brown and risen. Allow the focaccia to cool to room temperature on a wire rack. This week's Tuesday with Dorie is hosted by Erin of When In Doubt ... Leave It At 350. She selected Dorie's Mocha-Walnut Marbled Bundt Cake. I took some artistic licence with this cake to try and use up some of the ingredients I had about the house rather than buying new ones. Instead of ground walnuts, I used ground mixed nuts. I used around 3/4 cup milk and 1/4 cup coconut milk. I also had some candy canes from Christmas lying around, so to use them up, I blitzed them in the food processor and stirred them through the chocolate batter to give a choc mint flavour. I tried to get a "ginko" pattern as suggested by Dorie by pouring the chocolate on top of the white batter before swirling. However, I may have swirled too vigorously, as I have ended up with a mostly chocolate cake with just a thin outline of white. This cake tastes OK, but it is nothing out of the ordinary, and for the amount of effort (requiring the melting of chocolate and butter with coffee over a bain marie), I can think of many similar cake recipes I'd prefer, and which don't require ground nuts. The candy cane chips didn't really do much - they just added a slightly minty taste and a few flecks of colour. I hope it doesn't remind people of toothpaste! But don't take my word for it - it's nearly 11pm and I may just be over the day rather than anything else. To see how the other TWD bakers went, check out the TWD blogroll, and check out Erin's site for the recipe. Postscript: At Clivia's suggestion, I tried this again next day - it tasted much better than the night before. Heck, I really liked it!